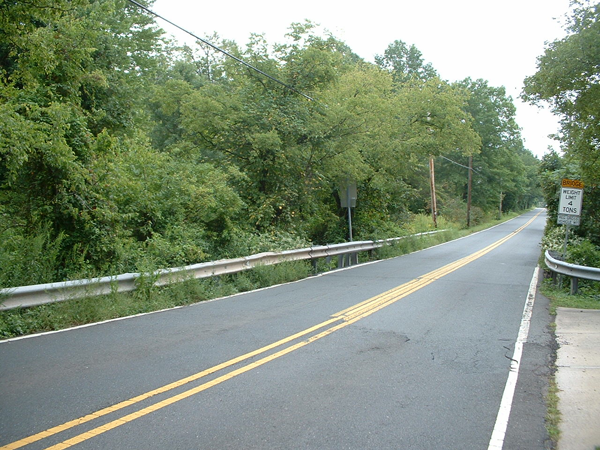 This bridge on Bennetts Lane is slated for replacement by Somerset County. Somerset County is preparing to replace one of its bridges on Bennetts Lane, work that will close a portion of the road for about four months. The bridge, which has been declared “structurally deficient” and “functionally obsolete,” is located less than a mile north of Route 27, and spans an unnamed tributary of the Six Mile Run. There’s no start time set yet for the work, which is projected to cost about $600,000. The project will be paid for through a $14 million bond ordinance. The work means that Bennetts Lane will be closed to through traffic between Clyde Road and Rt. 27, said Brian Maurer, the county’s principal bridge engineer. A detour has been established that will run from Rt. 27 to Veronica Avenue to Hamilton Street/Amwell Road to South Middlebush Road, he said. The bridge needs to be replaced because is superstructure – concrete-encased steel stringers supporting a concrete deck – is failing, said Mark Jenner, another county engineer. The structure will be replaced with a single, pre-cast concrete arch, he said. The current bridge has a road width of about 19 feet, which resulted in its “functionally obsolete” classification, Jenner said. The new bridge will correct that with a road width of about 30 feet, he said. Although the road will be partially closed, local residents will have complete access during the construction, Maurer said. A map of the proposed detour is below.